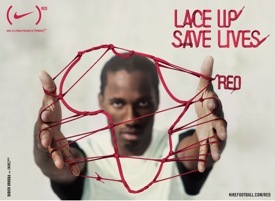 Cote d'Ivoire and Chelsea player Didier Drogba is one of (NIKE) RED's biggest proponents. Drogba scored two goals against Arsenal on the 29th of November wearing his brand new (RED) laces. On December 1, 2009, World AIDS Day, soccer superstars Didier Drogba, Joe Cole, and Clint Dempsey stood together in London with pop legend and humanitarian Bono to announce Nike’s new partnership with (RED) to fight HIV in Africa through sport. As Nike’s long-term partner in the fight against HIV and AIDS, Grassroot Soccer features in Nike’s story-telling around this initiative, bringing to life how football can play a powerful role in educating youth about HIV prevention. Grassroot Soccer is a lead story in a Nike-produced online spot that brings to light their joint HIV-prevention efforts in Soweto — the city being a focal point for Nike in South Africa in the coming months. A pair of Grassroot Soccer Skillz coaches get their close-up as narrators, sharing their personal experiences with HIV, their expectations for World Cup 2010, and how, through the power of soccer in their lives, they’ve overcome the risks and influences to which so many of their peers have tragically succumbed. 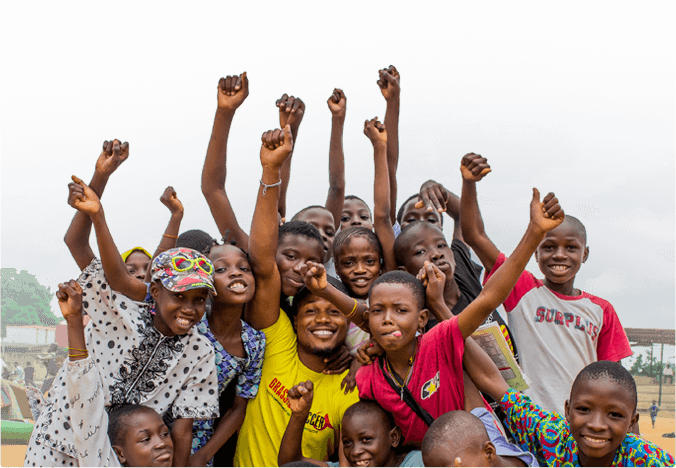 The campaign promotes Grassroot Soccer as an example of the type of program that is making a difference by raising HIV and AIDS awareness, enabling young people to make informed decisions, and using sport as a catalyst to engage and communicate to boys and girls. For the grand announcement of the partnership on World AIDS Day, football sensations from the world over, including Drogba, Joe Cole, and Clint Dempsey, stood shoulder-to-shoulder with pop legend and humanitarian Bono at NIKETOWN, in London. In Soweto, Grassroot Soccer coaches took to the pitch for Skillz demonstrations, and to the air with news organizations like South African Broadcasting and Al Jazeera to talk about Grassroot Soccer’s and Nike’s key roles in the fight against HIV and the meaning of the World Cup and initiatives like this to South Africa, the continent and the world. A portion of the proceeds from the sale of Red Laces, Nike’s signature (RED) product for the partnership, will be pooled and allocated via grants administered by the King Baudouin Foundation. Funds will be directed to organizations similar to Grassroot Soccer which are committed to fighting the spread of HIV and AIDS through the power of football. For more about the (NIKE) RED campaign, check out www.nikefootball.com/red. To see the first NIKE video profiling Grassroot Soccer, click here. The following are (Nike) Red generated posters featuring Grassroot Soccer coaches in Bulawayo and Soweto.